My best broccoli rabe recipe(s) follow below. 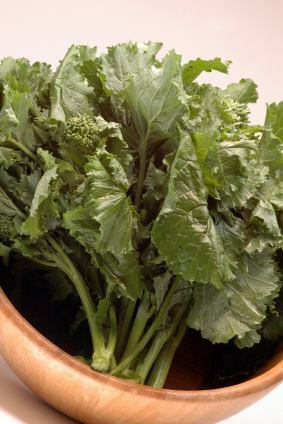 Broccoli rabe is commonly found in Italian dishes which is what you will find below. Here's one of my quick tips on how to trim broccoli rabe: Peeling the stems of broccoli rabe and boiling it will kill the bitter taste. A great tip if that is something you are experiencing. Cut an "X" in the bottom of the broccoli rabe stems and add to boiling salted water. Cook until tender; about 5 minutes. Drain. In a skillet over medium heat, add the olive oil and then the garlic. Cook for a couple of minutes. Stir in the broccoli rabe and saute for 10-15 minutes or until desired tenderness. Sprinkle with parmesan cheese before serving. Bring a large pot of heavily salted water to a boil and add the broccoli rabe. Boil until it is bright green in color and then immediately drain and plunge into ice water. Drain and set aside for now. In a skillet over medium-high heat, fry the diced pancetta until lightly crisp; or five minutes. Add the garlic and 2 tablespoons of olive oil. Toss in the red pepper flakes. Saute until the garlic is lightly browned or approximately 1 minute. Next add the broccoli rabe. Toss and cook until tender and heated through. Remove from the heat and add lemon juice. Transfer to a serving platter and garnish with more red pepper flakes and parmesan cheese. Bring salted water to a boil and add the broccoli rabe. Cook until tender or approximately 5-6 minutes. Immediately drain and plunge into ice water. Drain. Heat oil in skillet over medium high heat, add the garlic and saute for a couple of minutes. Add the broccoli rabe and season with salt, pepper and red pepper flakes to taste. Cook until heated through and serve immediately. This is a delicious broccoli rabe recipe that is comfort food at it's best. Bring a large pot of salted water to a boil and add the broccoli rabe. Cook for 4 minutes or until tender crisp. Strain the broccoli rabe and save the liquid to cook the pasta in. Set aside the rabe. Cook the orecchiette pasta in the same pot of boiling water that the rabe was cooked in. Boil until tender but firm; approximately 8 minutes or so. Drain and this time reserve 1 cup of the water that it cooked in. In a large skillet heat the oil over medium heat. Add the sausage and break up with a spoon while cooking. Fry until browned and cooked; or 8 minutes. Add the garlic and red pepper flakes to the cooked sausage and saute for for 30 seconds or so. Add the broccoli rabe and toss to coat evenly. Add the cooked pasta and reserved liquid - 1/4 cup at a time to moisten. Stir in the parmesan cheese and season with ground black pepper. Serve immediately or at room temperature. Bring a large pot of salted water to a boil and cook pasta according to package directions. Drain pasta and save the cooking liquid. Set pasta aside for now. Bring the cooking liquid to a boil again and blanch the broccoli rabe for approximately two minutes. Drain and set aside. Dredge chicken in flour and shake off any excess flour. Heat oil over medium-high heat and fry for 1-2 minutes or until golden brown on each side. Add garlic and broccoli rabe - season with salt and pepper and toss to coat. Add the wine and chicken broth, stir to combine and simmer for 3-4 minutes. Add the cooked pasta, stir to combine and remove from heat. Top with grated cheese. Fish never tasted so good with this broccoli rabe recipe. In a large skillet, heat one tablespoon of the olive oil. Add garlic, red pepper flakes, and a pinch of kosher salt. Cook for 2 minutes. Next add the thicker broccoli rabe stems with the white wine. Cover and cook until for 5 minutes. Add the remaining broccoli rabe pieces and cook covered for another 5 minutes or until all is very tender. Uncover the pan and add the olives and cook until liquid starts to evaporate. Next, add the lemon juice and season with kosher salt and pepper. Drizzle with another tablespoon of olive oil and set aside to keep warm with the lid on. Heat a large skillet over medium-high heat for 2 minutes. Season fish with salt and pepper and drizzle each side with 1/2 tablespoon of olive oil. Place the fish in the hot skillet and cook for 4-6 minutes on each side. Serve immediately with the broccoli rabe. Cut the broccoli rabe into 1 inch pieces. Blanch in boiling salted water uncovered for two minutes. Transfer broccoli rabe with a slotted spoon to a colander to drain and reserve the liquid it cooked in. Put broccoli rabe in a bowl for now. Set aside. Return the cooking liquid to a boil and add the spaghetti. Cook for 5 minutes (pasta will NOT be fully cooked). Drain. Add 1 tablespoon of olive oil to a large skillet and saute garlic and red pepper flakes for a minute. Pour the wine in and reduce until half of the wine is left. Add the cooked pasta and broccoli rabe and season with salt and pepper. Cook until liquid is reduced in half again. Drizzle with remaining olive oil and serve immediately - and top with grated cheese. I have more than broccoli rabe recipes, please check out more fresh vegetable recipes below.